Whisk together flour, zest, cardamom, and salt. Beat butter and sugar with an electric mixer until pale and fluffy, then beat in yolk and cream. At low speed, mix in flour mixture in 3 batches just until a dough forms. Quarter dough and form each piece into a 6-inch disk, then chill, wrapped separately in plastic wrap, until firm, 2 to 3 hours. 2. Roll out 1 piece of dough between sheets of parchment paper into an 11-inch round (1/8 inch thick). Slide dough in parchment onto a tray and chill until firm, about 15 minutes. 3. 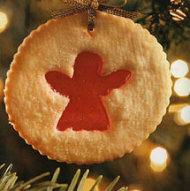 Cut out as many cookies as possible with cookie cutter (chill dough again if necessary), reserving and chilling scraps. Transfer cookies to a parchment-lined large baking sheet, arranging them 1 inch apart. 4. Bake until edges are golden-brown, 9 to 12 minutes. Cool on baking sheet 5 minutes, then slide cookies, still on parchment, onto a rack to cool completely. 5. Make more cookies with remaining dough and scraps (reroll only once) on cooled freshly lined baking sheets. 6. If icing cookies and coloring icing, transfer small batches to small bowls, 1 for each color, and tint with food coloring. Spoon each color of icing into separate sealable bags, pressing out excess air, and snip an 1/8-inch opening in 1 bottom corner of each bag. Pipe icing onto a plate to test consistency. If too thick, thin a small batch with a few drops of orange juice. 7. Decoratively pipe icing onto cookies, then sprinkle with decorative sugar (if using) and let dry completely, about 1 hour (depending on humidity). To make three-dimensional cookies, start with cut (but not baked) cookies on lined baking sheet. Make a 1 1/2-inch-long notch (1/3 inch wide) in each cookie, cutting toward center. If you want to make the cookies into ornaments, punch out a small hole (for string or ribbon to go through) on each side of notch on half of cookies using a piping tip with a 1/4-inch round opening. Bake and cool as directed. To make sure pairs of cookies fit, interlock cookies (one cookie with holes and one without) at notches to form sphere- or cube-like shapes. If necessary, carefully trim notches with a small sharp knife. If desired, ice unassembled cookies, avoiding middle portion near notch. Tie string or ribbon (if using) through holes of cookies and interlock. Using a pastry bag fitted with a piping tip results in cleaner lines of icing. Cookies (not interlocked) keep, layered between sheets of parchment if iced, in an airtight container at room temperature 1 week. By Gina Marie Miraglia Eriquez and Lillian Chou, at http://shine.yahoo.com/ .